Time was running out for a six-month-old boy whose liver was failing. He was visiting relatives in Malaysia with his family on June 7 when he developed jaundice and had diarrhoea seven times in a day. 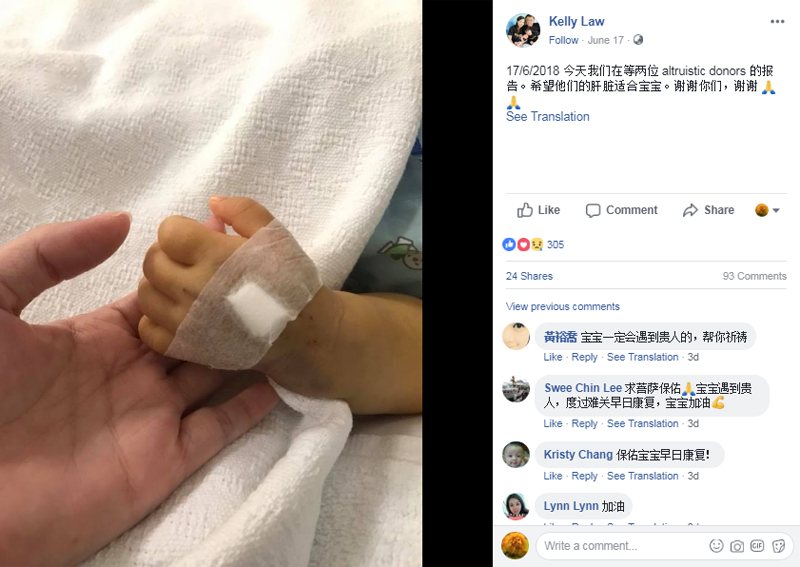 What his parents thought to be a regular bout of gastrointestinal disease turned out to be liver failure when they took him to see a doctor in Singapore. A liver transplant was the only way to save him. Although the baby's parents were more than willing to donate part of their livers, they were not found to be suitable candidates, Lianhe Wanbao reported. So the couple sought help on social media last Saturday (June 16), hoping to find a match for their ailing son. Three people were quick to respond to the family's online plea, and underwent medical checks on the very same day to see if they were suitable liver donors. Of the three, a 32-year-old woman was deemed to be the most suitable candidate and doctors at National University Hospital performed the liver transplant on Wednesday (June 20) morning. After a successful 12-hour surgery, both baby and donor are now recuperating in their wards. A liver donor is typically fit for discharge after a week's stay in hospital. The donor's liver will regenerate a few weeks after surgery and she will be able to live a normal life. The boy's mother Madam Kelly Law, 37, is full of gratitude towards her son's saviour. She told the Chinese evening daily: "It takes immense courage to make this decision and not everyone is able to do so." She commended the liver donor for her selfless act, saying "apart from one's parents, I don't think a person who is unrelated to the patient will be willing to undergo the transplant." Madam Law said she was especially touched to hear that the donor - who is a mother of a three-year-old boy herself - asked about her son's condition as soon as she woke from anaesthesia. They haven't met in person yet, but the donor said in a text message to Madam Law: "I hope that this transplant will inspire more people to help others."